Onkyo A-9010 review | What Hi-Fi? It’s fair to say there has been a shortage of talented yet affordable amplification in recent years. This has left just a handful of products such as Marantz’s PM6005 and the Rotel RA-10 hogging the limelight. The trouble is that these amplifiers weigh in at £300 or higher, leaving those on a more restricted budget looking at discounted stock for something truly musical. The arrival of the Onkyo A-9010 in 2015 changed that, bagging itself three successive What Hi-Fi? Award gongs for delivering a wonderfully musical performance for just £200. Not that you’d be able to guess just by looking at it. On the surface this Onkyo looks pretty ordinary. It is neat in a wholly functional way, lacking anything in the way of overt design flourishes. It’s clear that pretty much all the effort has gone on optimising the electronics. Like most offerings from established manufacturers, the A-9010 is well made and specified sensibly. There are defeatable tone controls, a decent array of line level inputs, a moving magnet phono stage and headphone output – all good, but nothing unusual for this price. For once we can say we like the supplied remote control. It’s a simple plastic unit but is nicely arranged and easy to use – not something that can be said of all remotes. It’s becoming the norm for budget amplifiers to have digital-to-analogue conversion built in. On paper such an approach makes sense considering most sources are digital anyway. But such an idea only has real value if the conversion modules fitted sound better than those used in the digital sources. In our experience that isn’t usually the case, with these number-crunching inputs adding little to the overall sound quality. The inclusion of such digital modules can also adversely affect the performance of the analogue circuits around them if enough care isn’t taken in implementation. The result is an amplifier that never reaches its sonic potential even through the analogue line stages. 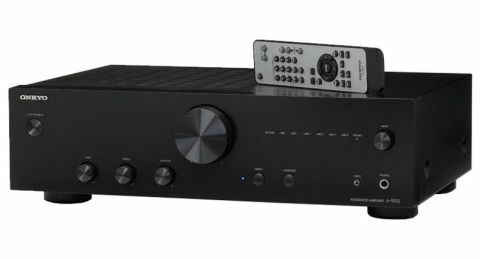 Onkyo has decided to bypass the whole issue by not going down the DAC route with the A-9010, instead preferring to improve other aspects of the electronic design. Start listening and it doesn’t take long to realise that the engineers have managed to deliver something special. The amplifier has been tuned in the UK, and that decision has paid off handsomely. The changes involve the use of improved components in key areas, and fine-tuning the power supply and audio circuits with the aim of producing a musically rewarding sound. It’s worth pressing the Source Direct button before you start any serious listening. This bypasses the tone controls and helps the amplifier sound that bit cleaner and crisper in the way it renders fine detail. We start off with Mountain Sound by Of Monsters and Men and are swept away by the amplifier’s energetic presentation. It sounds cohesive and well balanced, delivering a sense of drive and attack well beyond what we would expect. There’s composure too – the amp keeps the multitude of instrumental strands in check even when the music becomes demanding. Add the Onkyo’s superb timing and strong dynamic expression and you have an amplifier that makes listening to music fun. That’s a rare quality at any price. The A-9010 is happy across musical genres. It has enough refinement and insight to deliver John Williams’ Hymn to the Fallen (from the Saving Private Ryan OST) convincingly. A decent amount of scale is on show here, but it’s the way the amplifier deals with dynamic shifts that impresses us most. There’s a pleasing freedom to the way it hits peaks – and a surprisingly solidity too. Its tonality is nicely judged. The Onkyo sounds open and lively in the treble but never veers towards aggression. That’s a good thing considering budget equipment can often sound edgy or thin. The A-9010’s breadth of ability means that you don’t need to stick with similarly priced partnering kit. It’s quite happy driving the Q Acoustics 3050i floorstanders and is transparent enough to show differences between Marantz’s CD6006 UK Edition and Audiolab’s 8200CD. You can build a system around this Onkyo and develop it strongly without the amplifier becoming the limiting factor. The Onkyo brand is best known for its AV amps, but the A-9010 is a great indicator of just how good its stereo products can be. We should expect new additions to this range in the next year or so, and while the A-9010 may have lost its 2018 Award trophy to the Marantz PM6006 UK Edition, this talented Onkyo amp proves you can have a terrifically musical performance on a budget. Rival manufacturers should take note.